Multnomah County commissioners at their last regular meeting June 28, took two controversial votes, approving an exclusive emergency ambulance services contract over the objections of workers bound by it, and also voting to shut down the Multnomah County Community Involvement Committee (CIC). On both items, only Commissioner Loretta Smith voted against the proposals after offering comments critical of the board's decision-making processes; her support of ambulance and emergency services workers drew big applause despite warnings from county chair Deborah Kafoury that clapping is not allowed. Discussion of the Multnomah County Health Department contract for ambulance services with American Medical Response centered on new language eliminating what is called unit hour utilization -- UHU. The term refers to the flex time system used to allow ambulance drivers and Emergency Medical Technicians to decompress after difficult calls. County health official Paul Lewis testified that the contract represented possible improvements in the former system that involves UHU, which he described as a “crude” measure of working conditions for emergency workers. Lewis confirmed that county emergency services have excellent response times and survival rates especially for cardiac arrest cases, but he said the current system could be improved by better practices included in this current contract. His view was contradicted by the testimony of emergency workers who all argued that if the old system works so well, it should not be changed for a new idea that came only from management. Commissioners, over the objections of the workers, voted to four to one to approve the new contract anyway, and revisit it in six months to see if it is or is not an improvement. Smith zeroed in on why the UHU was removed from the contract, and the answer to her question appeared to be: Because experts hired by the County suggested it without input from actual emergency workers. 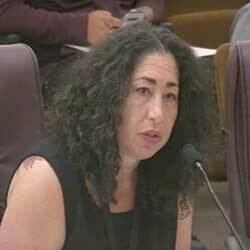 Allison Goldstein, program supervisor for Multnomah County EMS and Tri-County 911, spoke at the regular meeting of the Multnomah County Commission June 28, where the commission approved an exclusive emergency ambulance services contract over the objections of workers. "I just want to remind folks that the industry experts who were on our panel reviewing the proposal actually helped us craft the language around workforce fatigue and stress management and employee wellness," said Allison Goldstein, program supervisor for Multnomah County EMS and Tri-County 911. "So we’re actually taking feedback from people who are very well-versed in the industry across the nation to move in this direction." "I appreciate that and I appreciate you talking to experts, but on that particular task force did you have any folks from the unions on the task force?" Smith asked. "Our rules have very specific expectations about who our evaluation panelists are and they can’t have any conflicts of interest," Goldstein said simply. "The UHU does allow you to more accurately monitor, hour by hour, how each individual car is doing," said Jessica Mills, a paramedic in Multnomah County, who said she has also worked in Clark County as well as Clackamas County. Mills said, without UHUs, "You have 15 minutes once you get to the hospital to offload your patient, get your registration, register the patient with the hospital and find out which room you’re supposed to go to, load your patient onto the bed to wait for a nurse or doctor to give a report, and then clean all of your equipment and make sure you’re finished up all your documentation -- in 15 minutes." "Generally speaking, it’s easier to correct a contract change instead of waiting 12 months," Smith said. "Again, I think this is being made too hard. It is so simple to send this back, put in the language and it’s a quick fix -- we are not asking you to redo the entire contract." "We negotiated a contract with AMR, we did not negotiate a contract with the Teamsters," responded Commissioner Lori Stegman. She added that the county should trust that AMR will make sure their workers are not harmed. Smith invoked the recent US Supreme Court's Janus decision a few days earlier, which is expected to hobble the labor movement for years to come. "If we depended on companies to do the right thing," Smith said, "then we wouldn’t need labor unions, right? Also at the meeting last week, supporters of the current Multnomah County Community Involvement Committee argued against shutting down the panel; county officials argued that the move is temporary, designed to "reset" the group dynamic. The Office of Community Involvement was established by voters in the mid-1980s, and tasked "to facilitate direct communication between the people of Multnomah County and the Board of County Commissioners." Kafoury's office made the proposal to wipe away the current volunteers and recruit a new slate of them, because, officials said, there was "bullying" on the panel. Smith argued that the all-volunteer group is taking on weighty issues and that better leadership and training would be more helpful than shutting it down and kicking out the volunteers. In fact the group voted this year not to allow any county staff to sit on the community panel. Local public interest attorney Dan Meek submitted comments arguing that the county charter does not give commissioners the power to shut down the committee. The proposal called for investigation into alleged bullying and activities not “consistent with the charter.” The issue of bullying and cross-cultural harassment became a hot button at Multnomah County last year when Kafoury publicly apologized for calling Smith an obscenity during a board meeting that was picked up by the public address system, after a contentious discussion. Video and outline of the June 28 meeting can be viewed here. Editor's note: This article has been updated from an earlier version, which incorrectly referred to Multnomah County's ambulance contract as a "no-bid" contract. According to a spokesperson for the county, ambulance service contract was competitively bid with multiple companies attending the pre-bid conferences, but only AMR actually filed a proposal. The Skanner regrets the error.